A bride’s wedding day is most likely (unless you’re actually Kim Kardashian) the one day in your life where you’ll be photographed the most. For this reason, the majority of brides opt for natural make-up looks that subtly enhance the features and skin, without it taking centre stage in all the wedding photos. Celebrities seem to nail this natural wedding beauty look almost every time. Following on from the hype of the Royal Wedding, we decided to take a quick journey back in time and look at some of the best celebrity hair and make-up from these iconic days in celeb history. Starting our journey in the 50’s, how could we not include the beauty that is Audrey Hepburn? When she married Mel Ferrer in 1954, Audrey wowed in a high-neck gown and stunningly natural make-up, which highlighted her famously thick eyebrows. Rocking Coachella style decades before it existed, the actress wore a halo of flowers instead of a veil. 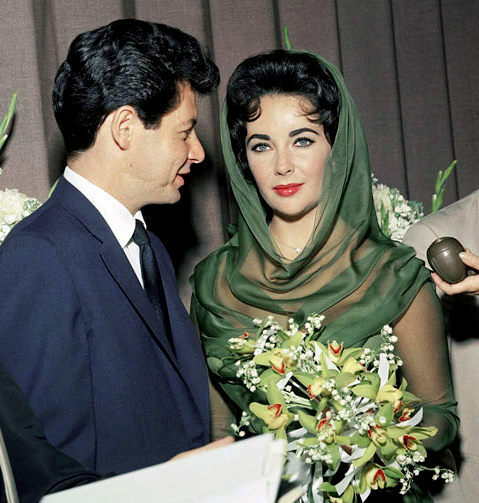 Famous for her multiple marriages, her wedding to Eddie Fisher in Vegas stands out as our favourite beauty look for Elizabeth Taylor. With curled short hair softly covered in her chiffon dress, the make-up pops with bold brows, liner and a jewelled pink lip. Kate opted for classic princess vibes when she wed Prince William back in 2011. Underneath her royal tiara and veil, Kate’s hair was half up, half down, twisted effortlessly away from her face. Her make-up look surprised many with its glamorous edge. Featuring both heavy blush and a pink lip, the princess wasn’t quite as natural as anticipated and we loved the extra glam effort. For the ultimate fashionista, many expected Olivia Palermo to adopt her most styled and glamorous look yet for her wedding to husband, Johannes Huebl. However, teaming perfectly with her flawlessly chic and simple sweater and skirt, the reality star turned fashion maven, opted for a simple mid-ponytail featuring carefree, oh-so-natural whisps. Solange Knowles, sister of bootylicious diva, Beyonce, wed Alan Ferguson in 2014 and killed it with the beauty look. Letting her stunning hair curl naturally and move in the breeze, Solange looked the ultimate laid-back bride. Make-up was glam with a pop of red on the lip and a slick of black liner to simply enhance and highlight. It wasn’t her first wedding, but somehow it was certainly her biggest. When Kim Kardashian wed Kanye West in 2014 the anticipation and hype was equal to the Royal wedding itself. Her flawlessly perfect hair and make-up was beautifully documented on every picture that escaped the day. Surprisingly though, her make-up was much simpler than many guessed, leaving the attention on her famously perfect contour and highlight. With royal wedding buzz still in the air, we managed to narrow our top celebrity beauty looks down to just these few. Would you have picked the same? What are your favourite celebrity beauty looks? Share your with us in the comments on Facebook and Twitter.